Prominent Spanish scholar and orator; son of the philosopher Solomon ibn Labi; lived at Saragossa. He was one of the twenty-five rabbis who by order of Pope Benedict XIII. assisted at the disputation of Tortosa (Feb. 7, 1413 = Nov. 12, 1414), where he distinguished himself by his oratorical ability. Labi translated into Hebrew, under the title "Gerem ha-Ma'alot," a work on plants and their uses in medicine, written in Arabic by his tutor Joshua Lorki at the instance of Solomon Benveniste (d. 1411), whose children Lorki was at the time educating (MS. Vienna No. 154). 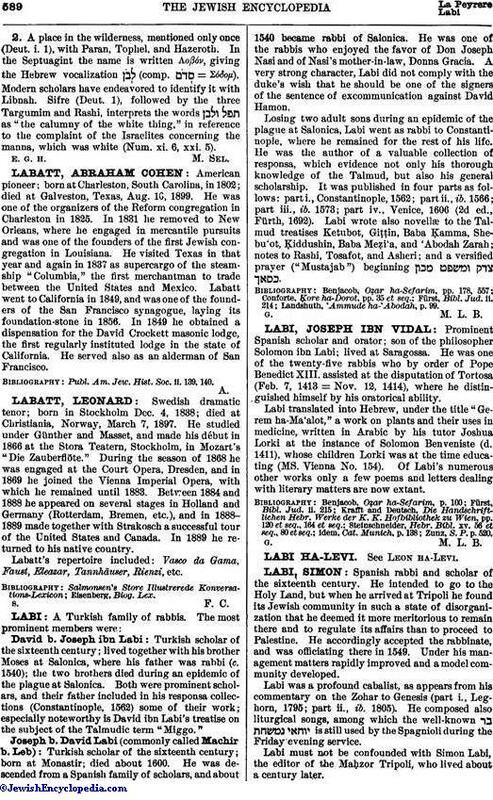 Of Labi's numerous other works only a few poems and letters dealing with literary matters are now extant. Zunz, S. P. p. 520.